Want a high speed, beautiful, and highly customize the Android messaging app. Okay, Textra is an outstanding messaging app for you. It is simply the best choice messaging app for Android mobile. This app designed as an amazing one, and it is the best alternative of your default messaging application. There are millions of users enjoying the Textra messaging app. Textra pro messaging offers a number of features to you. Everyone wants to have that features in their messaging app. This messaging app is simple. Beautiful. Hyper-fast. All the features in this app are free forever. This app comes with a plenty of great features. One of these features is dragging the bubbles. You can see the time stamps on the right side of the screen by dragging the bubble to the left. 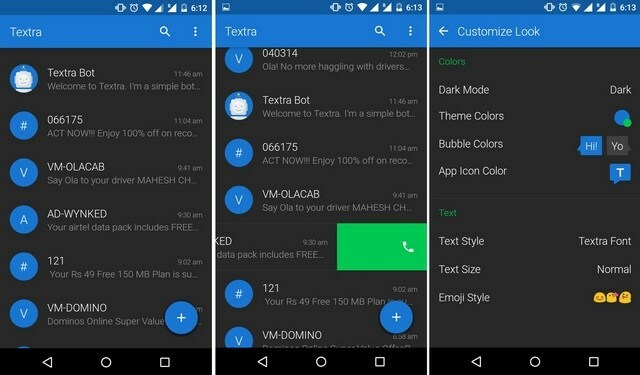 Textra sms pro will give you options such as message details, a copy of the message, delete and forward by tapping on bubbles. You can able to see who is on the conversation by tapping on the arrow at the right corner of the screen. It also gives you an option mute button, blacklist, pins the message at the top and shares the message by email. Customize screen allows you to change the bubble colors and change the shades of the both sent and received ones. And also you can able to change the text color in this messaging app. The other one you can customize is the notification bar. It gives you a set of options that you can customize. In this, tapping on the notification will let you send a quick reply without opening the messaging app. After sending the quick reply message, the toolbar automatically closed. Another important feature is, the messaging app offers a lot of emoji styles.